She may be a latecomer to the senior ranks, but 38 year-old Mary Menon takes her training very seriously and regularly logs 100-mile weeks in the tough Devon hills as she targets marathons and ultras. Ilfracombe Running Club’s Mary Menon has run 30 marathons, scores of ultras and numerous moorland challenges since 2014 – and won almost all of them, many of them overall. The 38 year-old has competed in over 100 races in the last few years, including some of the toughest off road events in the UK, and makes a habit of beating not only all the women, but the men too. Although the Devonshire mother of two competed during her school days, it was only five years ago that she started racing again. She hasn’t looked back since. Her most recent successes include victory at the notoriously hilly North Devon fell marathon at Woolacombe (for the fifth year in a row) and an overall win at the Race to the Tower 53m ultra along the Cotswold Way (more on that incredible race story later) – and that’s just in June! 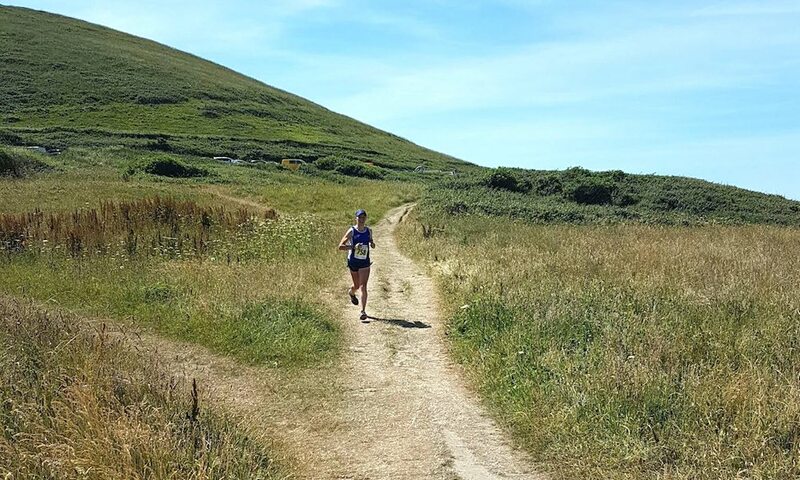 May saw her notch up wins at the Hartland Hartbreaker 18m in North Devon, where she finished 18 minutes ahead of the second woman, and another overall victory at the Race the Tide 29.5m challenge at Holbeton. The professional groom doesn’t restrict herself to off road glory, though. 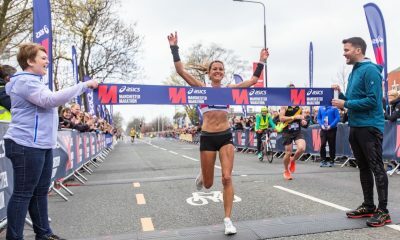 She spent March and April winning road races at the Yeovil half marathon (81:37) and the Taunton marathon (2:51:20), before running another sub-3 hour time in London, where she clocked 2:53:44 to finish sixth non-elite and 10th woman overall. Menon ran her marathon PB of 2:51:02 in the English capital last year. While the endurance queen concedes her mileage often reaches 100 miles a week, her training is by no means representative of a typical sub-3 hour marathon runner. 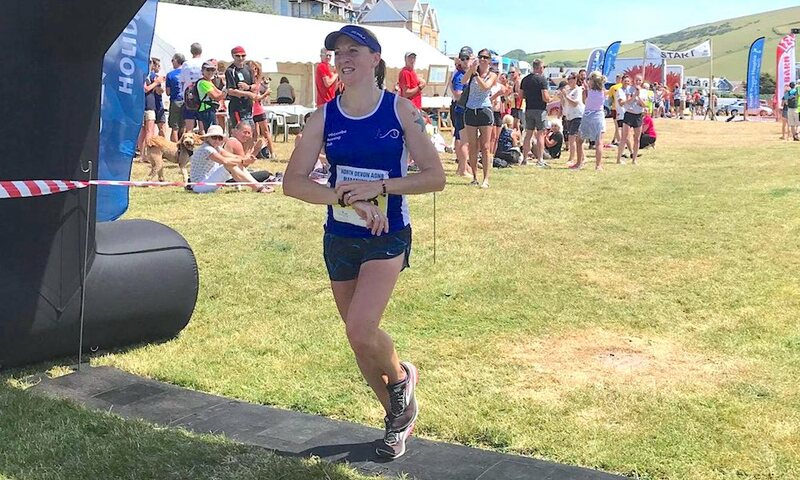 Here we talk to the North Devon athlete about her training, racing and what it takes to win almost every race she contests, beating men and women in the process. Fast Running: You’ve always lived in Devon, would you say living and training on the moors has helped you become as strong as you are in the extreme challenges you take on so successfully? Mary Menon: I’m fortunate to live in a beautiful part of the country where the running is both breathtakingly beautiful and tough, which allows me to train for the toughest terrains while barely noticing. I love running both for the freedom and challenges that it provides and also for the fantastic people that I have met along the way. I grew up on a farm in Devon, and, as a youngster, I used to do much of my training around the woods and fields. Similarly, living in the middle of the Exmoor National Park has given me the opportunity to run across the terrain I most enjoy – lots of hills, and predominantly off road. FR: You only started competing as a senior athlete at the age of 33 – why is this? MM: Although I ran for my school and college in cross country and athletics and for the county in both, I stopped competing when I moved to Exmoor. I carried on running but just for my own health and amusement. However, shortly after having my second child I started running daily with the double pram to lose baby weight, and with a little more time on my hands having cut back on work. In 2013 I entered a local 10k trail race – the Exmoor Stumble – and despite some reservations about competing again, I finished second lady! 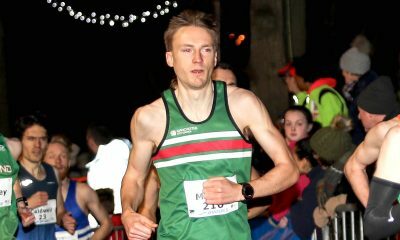 Menon continues: Although the Stumble and the South Molton Struggle 7.8m are tough, I chose them as my first races back because they’re closest to where I live and across the terrain I know and enjoy. FR: You are a busy working mum to two children (Alice aged 8 and Ferdy aged 6) – how do you fit your 80-100 miles a week training in? MM: I work hard to fit this around my work and family commitments. I’m not afraid of getting up early to help fit this in, and I’m fortunate that my husband also runs, so understands what I need to do. There is quite a lot of plotting and rushing around, and I frequently take a sandwich with me on a lunchtime run to save time! I work part-time as a professional equine groom and look after our menagerie of sheep and ponies, but I do like to run every day and fit in some core and weight training with a session on the spin bike and some HIT training too! FR: What does a typical training week look like for you, if such a thing exists? MM: Most weeks will include one or two long runs, some hill reps, speed work and some general running too – I rarely run the same route twice in a week. On a full training week, I tend to reach 80-100miles, but I race quite frequently, every two to three weeks, so I also have taper weeks amongst this. I like to include one or two long runs in my training week because I love running across Exmoor and can’t resist the beautiful countryside. I do like to make sure that I have done my running homework too! FR: You have found your niche in marathons and ultras – tell us how you came to find your strength over the long distances? MM: When I came back to racing, I clearly remember thinking that I wouldn’t ever run a marathon distance race. However, while I was training for a half marathon it occurred to me that I was pretty much reaching marathon distance training anyway, and that I enjoyed the long runs most of all. It was a last minute decision to change up from the half distance at the North Devon Marathon in 2014 to the full, and I enjoyed it so much that I won it! I have returned to that marathon every year since and completed 30 marathons during that time, winning 26 of them. I enjoy marathon distances most of all, but I thrive on racing lots of different distances over varying terrain. FR: Which marathon would you consider your favourite of the 30 you’ve completed so far? 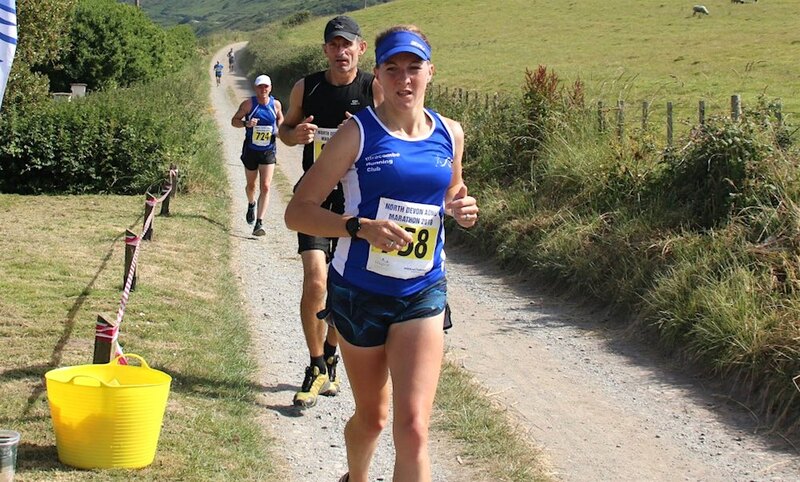 MM: The North Devon Marathon stands out as it was my first marathon, so it has a sentimental connection. It is also run over a beautiful part of the countryside – the South West Coast path is a lovely part of the country to race over, and it suits my ‘tough it out’ running style. The London marathon is an obvious classic of the running year, and, although I like to tell everyone how much I dislike racing on tarmac, I seem to do quite a lot of it! I think a spring road marathon gives me something to focus on through the tough winter training months. I also loved the Puretrail Dartmoor 3in1 race last October, which is exactly what it says on the tin! Run on a tough part of Dartmoor, it consists of three races (5m, 7.5m and 9.75m) in one day – the quicker you run, the more time you have to recover between races, but you need to consider having the stamina to last the day, as it’s 23 miles in total. While your results are added up to get your final placing over the three races, you also need to be aware that some runners will only race one or two races, so could easily throw you off your pace. It was massive amounts of fun last year and is one of the races that I am most looking forward to running again this autumn. FR: Tell us about the Race to the Tower ultra marathon along the Cotswold Way last month (June 9), which you won overall in 8:46:52 after getting lost in the final kilometres of the 53 mile race! MM: This year I decided to put a toe in the water of the ultra running world (I have run a couple of ultras before but not over this mileage), more for the future than an immediate distance change to see if I might like it. I thoroughly enjoyed myself, the race went according to plan and I felt strong throughout, taking the overall lead at mile 34 and running on from there. That was, until mile 47, where I ran out of arrows facing the right way! After running an extra two miles up and down a steep track trying to find a directional arrow to get back on course, the second and third place runners eventually arrived also on the wrong course and between us (and second placed) Greg Price’s GPX file on his watch, we managed to get back on track to complete the race. Greg caught back up with me 200 metres from the finish line, but assured me that the race was mine, as if there hadn’t been a course malfunction he knew that he wouldn’t have caught up with me at all. Very sportingly, he allowed me to cross the finish line first. FR: Considering you run hundreds of miles a month, every month, what kit and fuel do you swear by to get you through the tough training? MM: The kit that I like to use for the road are Brooks Ghost 10 trainers for their comfort and fit for long runs, and for off-road I like to wear Innov8 250 Terraclaws. I wear Nike rival shorts for both, Hilly socks, and I wouldn’t be without a Shock Absorber run bra! 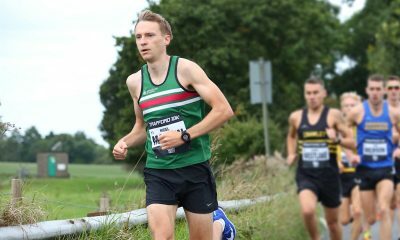 I always wear my running club vest when competing, and I also wear a 2XU visor for summer trail races. FR: Finally, you only joined a club for the first time less than two years ago – what made you choose Ilfracombe (IRC)? MM: I’d been a bit of a lone wolf with my training until I joined them in 2016, but I picked IRC because they had a reputation for being friendly and easy going while maintaining a competitive edge, and this has proved correct! They cater for all abilities and we have a lot of fun. I train with them at least once a week and compete in the team at various club events as well. Considering she covers up to 160 kilometres across moorland every week, often getting up at the crack of dawn to do a long run twice a week, the importance of having club mates to train with and discuss race tactics cannot be overstated! Menon will now look to compete over the marathon twice in Cornwall in the coming couple of months, so keep an eye out for more overall wins for the gutsy girl from Devon.